dude looks pretty damm good to me!! 10 sets of 20 on squats is a great program................. ...to turn your legs into toothpicks. The reigning world record holder in the 10,000m does high rep squats Kenesisa Bekele (sp). Wow, more Rich Piana picts please! His legs are probably bigger than your chest, "sarcasm". his legs really aren't that impressive, they have good cuts but they're not that big. This guy has an ideal physique, enough mass, , hardness and thickness, but geat lines and balance. yo Rich, got any more recent pics? Rich has been around for sometime won some big show's yet to make big impact nationally,on a funny note he did a total gym ad on tv with chuck norris few year's back said it gave him good pump. 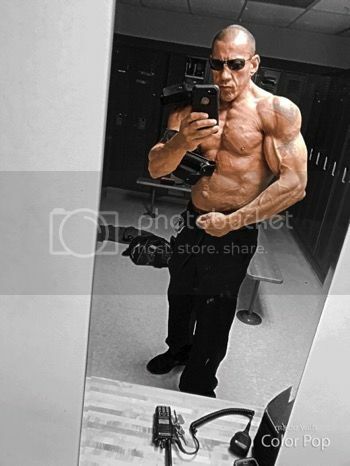 Rich has been around for sometime won some big show's yet to mae big impact nationally,on a funny note he did a total gym ad on tv with chuck norris few year's back said it gave him good pump. He meant it gave his wallet a decent pump. jesus wtf happened? that's scary.